Would tu watch any new shows o cine with Alyssa, because of her o the movie? la elección de los fans: Because of Alyssa! she is amazing and I would watch it just because she's in it. which one of phoebes powers whould tu like to have? Since when are tu fan of Alyssa? Did tu like Alyssa in My Name Is Earl? Are tu really running for public office? Why would anyone vote for a mindless twit like you? ALYSSA IS PREGNAAAAAAAAANT ! :D .. what do tu think about her being pregnant ? Hall Pass estrella Alyssa Milano is still a fan favorito! three decades into her career. 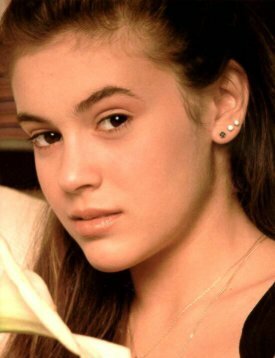 Since becoming a child estrella in the 1980s, Alyssa Milano has taken on plenty of roles: Model. Producer. Singer. Author. Philanthropist. Entrepreneur. Ask which one she identifies with the most, though, and she’ll pick a role that’s a little más down-to-earth. Sports fans Alyssa Milano and David Bugliari brought their adorable son Milo, 2 1/2 months, to the Staples Center for his first ever LA Kings hockey game over the weekend (November 19). Unfortunately the inicial team fell to defeat, but it doesn't look like Milo was too concerned with the score board anyways. The book "Art & Soul" from Pulitzer Prize-winning photographer Brian Smith features portraits of celebridades who support TheCreative Coalition, as they share personal stories about the impact of art on their lives and on society. The 38-year-old actress and husband David Bugliari welcomed Milo into the world seven weeks hace and they decided to decorate his room in a way he will appreciate when he is older. Alyssa said: "David and I decorated the nursery ourselves. We wanted to give him a warm cosy el espacio he could grow into. The actress and social-media estrella will be the boss of Milo Thomas Bugliari, born Wednesday morning. Milano and her agent hubby got their bundle of joy — clocking in at 7 pounds and 19 inches long — a little before 10 a.m., People said. Milo is a first child for Milano and Bugliari, who married in 2009. During her pregnancy, the actress has been über-active on Twitter, tweeting her excitement, offering tips for cloth diapers and even answering fans’ preguntas about motherhood. Alyssa Milano was named the 61st ranked Sexiest Woman Alive por Smartasses.Net on Thursday, March 17th 2011, when the online men's magazine revealed their everpopular who's who of the hottest women on the planet. 2011 marked the sixth annual año for the increasingly popular Smartasses parte superior, arriba 100 Sexiest Women List, which comes out every St. Patrick's Day, to coincide with March Madness. For Milano, it was her third año on the list. Last año she was ranked 50. For more, visit Smartasses.Net. a question se añadió: Are you really running for public office? Why would anyone vote for a mindless twit like you?